The Columbus Deluxe slot from Novomatic takes you on the epic voyage across the seven seas. Join the search for a new passage way to India which resulted in the discovery of a new continent. Set sails with the Nina, Pinta and Santa Maria and you might find what you are looking for. 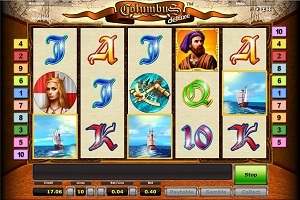 The Columbus Deluxe is a 10 line / 5 reel slot machine from Novomatic where Columbus himself is the Wild. His three ships Nina, Pinta and Santa Maria, will need to sail in on the 1st, 3rd and the 5th reel to activate your Bonus Feature. The winnings during your 10 free spins will be multiplied by 3 and you will be able to re-trigger the free spin feature from within the Bonus Feature. Graphics & Appearance: The Columbus Deluxe slot is a very beautiful slot machine. The graphics are clear and the overall design is pleasing for the eye. The colouring used for symbols and paylines are easy to distinguish. Gamble Feature: The Columbus Deluxe double up feature is a 50/50 chance. You either choose a red or a black card by clicking on either of the two buttons. After you’ve chosen your colour, the deck of card will flip the top card and reveal your destiny. If you picked the same colour as the card revealed, you have doubled your winnings and you can either try to double again or collect the winnings and return to the reels. If you picked a colour that was not revealed, your winnings are lost and you are taken back to the reels again. Game Symbols: Apart from the 10, J, Q, K and A symbols, you have a number of different symbols such as a beautiful female face which represent the Spanish Queen, a navigation tool symbol, a carcanet symbol. The wild symbol is an image of Columbus (oh yeah, really?). The scattered symbols are the Ships - Nina, Pinta and Santa Maria – three of these and you will trigger the bonus feature. The Columbus symbol will substitute for all symbols except Nina, Pinta and Santa Maria (the ships). The Columbus symbol will also double the payouts when used as a substitute. During the bonus feature, Columbus and his three ships will substitute for all symbols. Bonus Feature: The Columbus Deluxe bonus feature is free spins. The free spin feature is triggered by hitting the Nina, Pinta and Santa Maria (the ships) on reel 1, 3 and 5. You will then be awarded 10 free spins. During the free spins all winnings are multiplied by 3. You can also re-trigger the free spins while in the free spin feature and by this remain in the X3 bonus feature over and over again. The Columbus and the Nina, Pinta and Santa Maria symbols will substitute for all symbols during the free spin feature. Betting Options: The Columbus Deluxe is a 10 line / 5 reel slot. You will be able to configure your coin size by using the + and – symbol in the slot window. Game Features: The Columbus Deluxe slot have an Autoplay feature which can be very comfortable to use. You will stop the Autoplay feature by hitting the Stop button at any time during the feature. Please not that by using the Autoplay feature, the option to use the Gamble Feature will be deactivated and you will not be able to gamble your minor winnings. The Autoplay will of course stop if you would hit the three Nina, Pinta and Santa Maria (ships) symbols and trigger the Bonus Feature.